On the economic front, investors got their second look at first quarter Gross Domestic Product (GDP) growth last week and the revised estimate shows that the economy contracted by 1.0% in the first three months. Markets shrugged off the disappointing news, partly because much of the GDP drop can be attributed to weather. Despite the dip in Q1 GDP growth, Philly Fed President Charles Plosser is still optimistic about a stronger second quarter and projects that annual GDP may still reach 3.0%. A gauge of consumer sentiment fell in May as Americans worried about stagnant wage growth. While most respondents were confident that the economy is on an upward trend, many were concerned about how poor income growth will affect their standard of living this year. Jobless claims fell sharply last week. The four-week moving average of claims also fell to a new post-recession low, indicating that the labor market continues to recover. You might have heard of the seasonal investing trope "sell in May and go away." The theory is that stock investors should sell out of their positions in May and buy again in November because they should avoid holding equities over the summer. 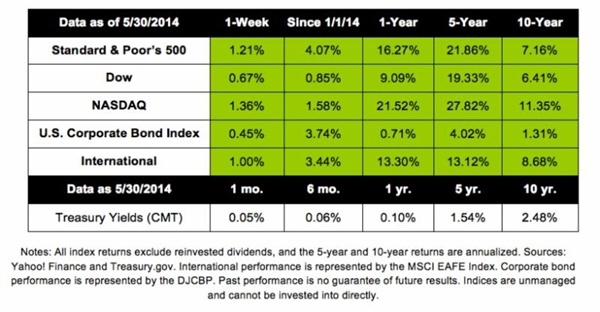 The strong performance markets experienced last month is a perfect example of why you should ignore these types of formulas. Complex market behavior is impossible to predict with any accuracy, and long-term investors need to focus more on long-term financial goals than on short-term market performance. The week ahead is heavy with economic data, including the much-anticipated May jobs report, which investors will look to in order to confirm the upward trend in the labor market. Durable goods orders rise unexpectedly. Analysts were surprised by a sudden increase in April orders for long-lasting goods. This is the second straight month of solid gains, indicating that the manufacturing sector - contributing about 12.5% of GDP - is rebounding with the overall economy. Fewer Americans rely on food stamps. In a positive sign for the financial health of low-income households, the number of Americans claiming Supplemental Nutrition Assistance Program (SNAP) benefits has fallen. As the economic recovery continues, it's hoped that government spending on SNAP benefits will continue to drop. U.S. personal spending falls in April. Personal consumption, a government measure that captures overall spending on goods in services, fell slightly in April after rising a seasonally adjusted 1.0% in March. Some of the decline can be attributed to lower spending on heating as the weather warmed, indicating that underlying consumer demand still remains strong. Home prices rise in March. Prices of U.S. single-family homes continued to rise in March, but at a slower pace than a year ago. This is a sign of persistent deceleration in the housing market. However, it may represent a return to normalized home buying activities driven by underlying economic fundamentals rather than pent up demand.